By the end of this chapter, you should be able to install and start Zope. It is fairly easy to install Zope on most platforms, and it typically takes no longer than ten minutes to complete an installation. There are typically two types of Zope releases: a “stable” release and a “development” release. If you are new to Zope, you almost certainly want to use the “stable” Zope release. You may download Zope from the Zope.org web site, from which the most recent stable and development versions are always available in the Download area. Zope comes as a “binary” release for the Windows platform, and in source format for UNIX-like operating systems. Zope may be compiled on almost any UNIX-like operating system. Zope has reportedly been successfully compiled on Linux, FreeBSD, NetBSD, OpenBSD, Mac OS X, HPUX, IRIX, DEC OFS/1, and even Cygwin (the UNIX emulation platform for Windows). As a general rule of thumb: if Python is available for your operating system, and if you have a C compiler and associated development utilities, then it is highly likely that you will be able to compile Zope. A notable exception is Mac OS between versions 7 through 9, as Zope does not run at all on these platforms. Zope’s installation steps vary somewhat, depending on your operating system platform. The sections below detail installing the binary version of Zope on Windows on Intel platforms, and a source installation on Linux. 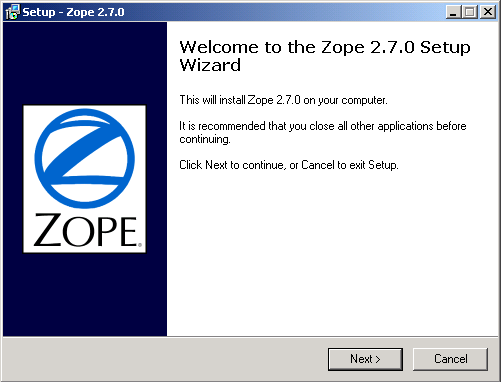 The “Win32” version of Zope works under Windows 95, Windows 98, Windows ME, Windows NT, Windows 2000, Windows XP, and Windows Server 2003. 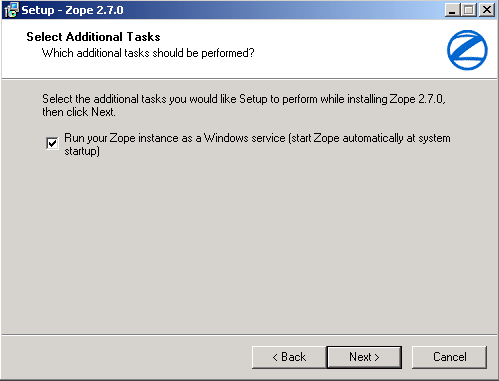 Zope for Windows comes as a self-installing .exe file. To install Zope, first, download the Win32 executable installer from the Download area on Zope.org. It is typically named something like “Zope-2.X.X-win32-x86.exe” where the “X“‘s refer to the current Zope version number. Download the current stable release installer for Windows from Zope.org using your web browser. Place the file in a temporary directory on your hard disk or on your Desktop. Once the installer file has been downloaded, navigate to the folder into which you downloaded the file, and double-click on the file’s icon. The installer then begins to walk you through the installation process. Click Next. The installer asks for an installation path. The default is usually acceptable, though you are, of course, free to choose another path. Then click Next. You then can choose which components to install. You should select “Full installation” unless you have previously installed Zope and know what you are doing. On the next screen, you may customize the entry placed in your Start Menu folder. Click Next again. 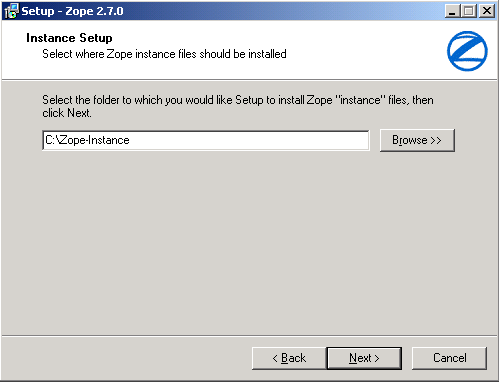 The installer now asks you whether you would like to run Zope as a service, unless you are running Windows 98 or ME, on which such services are not available. If you are only running Zope for personal use, there is no need to run it as a service. Upon clicking Next, the installer takes you to the “Instance Setup” Screen. You can have more than one Zope running on your PC, but each has to have its own Instance Home, which is the path to specify here. This path is where Zope will later place its database files. Make sure that you have enough disk space left on the specified drive and that you can make backups easily. The Next screen asks you for a password for an initial administrative account. You use this account to log in for the first time and create more users. Note that the installer does not ask you to verify your password, so be careful not to mis-type it. Click Next after entering a password. The installer presents an overview, form which you can commence installation by clicking Install. After a few moments, the Zope installer will present you with a “Completion” screen. 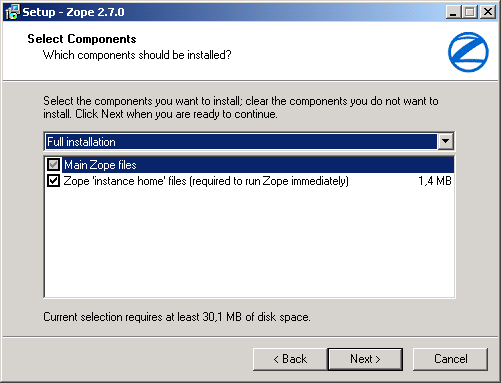 Let the installer start Zope for you, or start Zope manually by navigating to the Zope folder in the Start Menu and selecting “Run Zope in Console”. See the section below entitled Starting Zope. install the Python language on your system from source, or install a binary Python package, including development headers. Zope is written primarily in the Python language, and Zope requires Python in order to be able to run at all. While binary versions of Zope ship with a recent Python version, the source Zope distribution does not. Zope developers try to use the most recent Python for Zope, but often the latest Python version is more recent than the officially-supported Zope version. Zope 2.12 requires Python 2.5.4 or later, and Zope versions 2.11 and 2.10 require a Python 2.4. *x* version equal to or greater than 2.4.3. For the most recent information on which version of Python is required for compiling Zope, see the release notes on the release Web page. You can obtain detailed instructions for downloading, compiling, and installing Python from source at the Python.org website. Most Linux distributions ship with a pre-installed Python 2.5, but care is required when attempting to use a vendor-installed Python to compile Zope: some of these vendor-supplied Python distributions do not ship the necessary Python development files needed to compile Zope from source. Sometimes these development files are included in a separate “python-devel” package that may be installed separately, but sometimes they are not. The binary packages that ship with Debian have been used with some level of success, but it is generally advisable to compile and install Python from source if you wish to also compile and install Zope from source. After downloading, compiling, and installing Python from source, download the current Zope source distribution. See the Zope.org Downloads area for the latest Zope source release. where * represents the Zope release version of the source tarball. Zope now uses the conventional UNIX build sequence: configure, make, make install. Replace /where/to/install/zope above with an appropriate path, such as ~/myzope/zope2. This path is referred to as the ZOPE_HOME. If you want to install Zope in a system directory instead of your user home, replace ~/myzope/zope2 with an appropriate path, e.g., /usr/local/zope2, and make sure that you have suitable privileges for installing and starting Zope (‘sudo’ or ‘root’). 2.6.1 2.6.0 also work, but not as optimally. In this case, you must point the installer to your Python interpreter, which you should have installed previously, either from a binary package or compiled from source. Replace /usr/local/bin/python with the path to your Python executable. With the Zope binaries installed, you are now ready to create a Zope instance, which holds configuration and runtime data for a single Zope server process. This helps keep your own or third-party software separate from the main Zope source. The directory where your instance should be located, or the INSTANCE_HOME. The instance home will hold your database files, log files, configuration files, and scripts to start and stop the instance. For our example, we assume the instance home to be located at ~/myzope/instance. You will have to provide the username and password you wish to set; optionally, you can specify the hashing method and an additional domain restriction. Zope installation is now complete. Read on to see how to start your brand-new Zope. 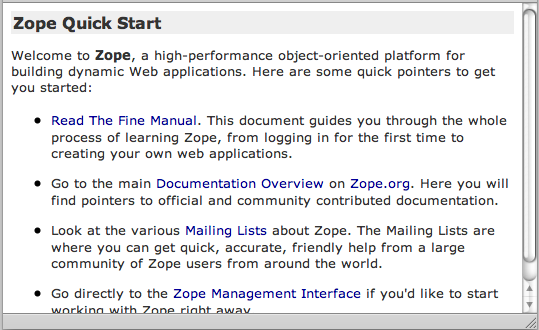 Zope is managed via a web browser, and Zope contains its own web server (called ZServer). A successful Zope startup implies that Zope’s web server starts, which allows you to access the Zope management interface (ZMI) via your web browser. You can access the ZMI from the same machine on which Zope runs, or you can access it from a remote machine that is connected to the same network as your Zope server. Zope’s ZServer will “listen” for HTTP requests on TCP port 8080. If your Zope instance fails to start, make sure that another application isn’t already running on the same TCP port (8080). Zope also has the capability to listen on other TCP ports. Zope supports separate TCP ports for FTP (File Transfer Protocol), “monitor” (internal debugging), WebDAV (Web Distributed Authoring and Versioning), and ICP (Internet Cache Protocol) access. If you see messages that indicate that Zope is listening on ports other than the default 8080 HTTP, don’t panic: it’s likely just one of these additional ports. If you wish, you can configure your existing web server to serve Zope content. Zope interfaces with Microsoft IIS, Apache, and other popular webservers. 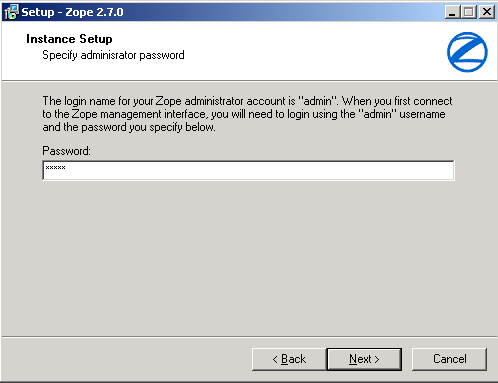 IIS: see brianh’s HowTo on using IIS with Zope. Also of interest may be the WEBSERVER.txt file in your Zope installation’s doc directory, and hiperlogica’s Connecting IIS to Zope article. If you are just getting started with Zope, note that it is not necessary to configure Apache, IIS, or any other web server to serve your Zope pages, as Zope comes with its own web server. You typically only need to configure your existing web server if you want to use it to serve Zope pages in a production environment. If you’ve installed Zope to “run manually” (as opposed to installing Zope as a “service”), navigate to the Zope folder in your Start Menu and click on Run Zope in Console. A console window with process startup information will be displayed. If you chose to run Zope as a “service” on Windows NT/2000/XP, you can start Zope via the standard Windows “Services” control panel application. A Zope instance started as a service writes events to the standard Windows Event Log; you can keep track of the Zope service’s start and stop events by reviewing the Event Log. A Zope instance which has been installed as a “service” can also be run manually by invoking the Run Zope in Console menu entry as described earlier. Take care not to run Zope manually and as a service at one time: make sure to stop the Zope service first before starting it manually. ZServer (Zope’s server) supports setuid() on POSIX systems in order to be able to listen on low-numbered ports, such as 21 (FTP) and 80 (HTTP), but drop root privileges when running; on most POSIX systems, only the root user can do this. The most important thing to remember about this support is that you don’t have to start ZServer as root, unless you want to listen for requests on “low” ports. In fact, if you don’t have this need, you are much better off just starting ZServer as a user account dedicated to running Zope. ‘nobody’ is not a good idea for this user account, because if any other daemon on a system that ran as nobody were to be compromised, this would open up your Zope object data to vulnerability. If you do need to have ZServer listening on low ports, you will need to start zopectl as the root user, and to specify what user ZServer should setuid() to. This can be done by setting the effective-user parameter in your Zope instances configuration file, residing in $INSTANCE_HOME/etc/zope.conf, and by making sure that the log and database files are writeable by this user. To use and manage Zope, you will need a web browser. Start a web browser on the same machine on which you installed Zope, and browse to the URL http://localhost:8080/. If your Zope instance has been properly installed, and you’re visiting the correct URL, you will be presented with the Zope “QuickStart” screen. If you see this screen, congratulations! You’ve installed Zope successfully. If you don’t, see the Troubleshooting and Caveats section below. For some of the tasks you want to do with Zope, you need to use its management interface: the ZMI. To log into the ZMI, use your web browser to navigate to Zope’s management URL. Assuming you have Zope installed on the same machine from which you are running your web browser, the Zope management URL will be http://localhost:8080/manage. Successful contact with Zope via this URL will result in an authentication dialog, into which you can enter the “initial” username and password you chose when you installed Zope. You will then be presented with the ZMI. If you do not see an authentication dialog and the ZMI, refer to the Troubleshooting and Caveats section of this chapter. When you are using the ZMI, you can use the Zope Control Panel to control the Zope process. Find and click the Control_Panel object in ZMI. 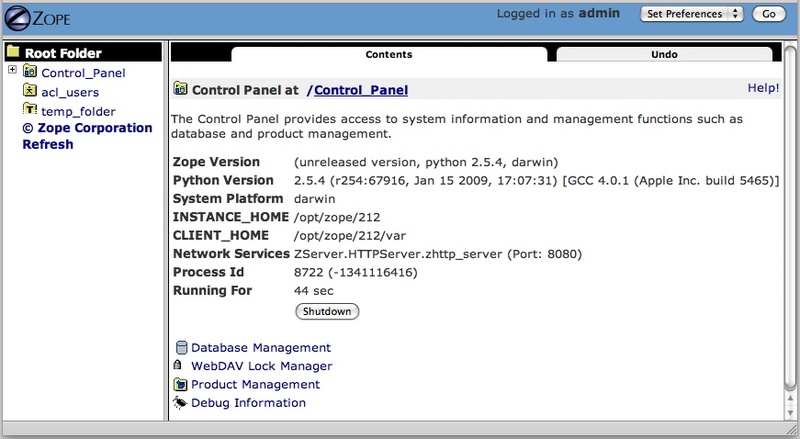 The Control Panel displays information about your Zope, such as the Zope version you are running, the Python version that Zope is using, the system platform, the INSTANCE_HOME, the CLIENT_HOME, Zope’s process id, the network services that have been started, how long Zope has been running for, and other installation specifics. Several buttons and links will also be shown. If you are running Zope on UNIX or as a service on Windows, you will see a Restart button in the Control Panel. Clicking Restart will cause Zope to shut down and then immediately start back up again. It may take Zope a few seconds to come back up and start handling requests. You don’t need to shut your web browser down and restart it to resume using Zope after pressing Restart, as the page refreshes automatically; just wait for the Control Panel display to reappear. To shut Zope down from the ZMI, click Shutdown. Shutting Zope down will cause the server to stop handling requests and exit. You will have to manually start Zope to resume using it. Shut Zope down only if you are finished using it and you have the ability to access the server on which Zope is running, so that you can manually restart it later as needed. If you started Zope in the foreground, press “Ctrl+C” in the terminal window from which you started Zope. Zope’s configuration is done via the file ‘$INSTANCE_HOME/etc/zope.conf’. This contains numerous configuration directives for customization. The address directive determines the port on which the respective server listens. The HTTP Server in this example listens on port 8080. The port-base directive comes in handy if you want to run several Zope instances on one machine. port-base specifies an offset to the port on which all servers listen. Let us assume that our HTTP Server’s ‘address’ directive is set to 8080, as in our example above, and ‘port-base’ is specified as 1000. The port on which the HTTP server will listen, will be the address value of 8080, plus the port-base offset value of 1000, or 9080. Assuming the FTP server’s address directive is set to 8021, the FTP Server will then listen on port 9021, and so on. This directive is a switch, specified as either on or off. When set to on (the default), Zope runs in debug mode, which causes Zope to reload file system-based templates, and several other settings suitable for development, in real time. In a production environment, to reduce unnecessary overhead, you should ensure that this directive is set to off unless you are actively troubleshooting a problem. This directive causes Zope to setuid(2) to the specified user when run as root on a UNIX system. This method boosts system security, as a compromised Zope instance would not enable a compromised user to damage easily an entire system. One motivation for running Zope as root in the first place is to be able to bind to privileged ports, or ports with values below 1024. Access logging logs individual HTTP Requests in a common format, by default to the file log/Z2.log in your instance home. Event logging logs Zope events, such as start and stop information and debugging messages. Trace logging logs detailed Zope debugging information. Each log message has an associated severity level, ranging from CRITICAL, ERROR, WARN, and INFO, to DEBUG and ALL. You can specify a filter for log messages with the level directive inside a logger stanza. Set the level to ALL to get all log messages, or to ERROR or CRITICAL to see only the most serious messages. For further documentation, see the inline comments in zope.conf. The first log entry indicates that Zope’s web server is listening on port 9673 on host arod. This means that the management URL is http://arod:9673/manage. As mentioned previously, Zope only prints to the console when started in the foreground, with ./runzope or runzope.bat. 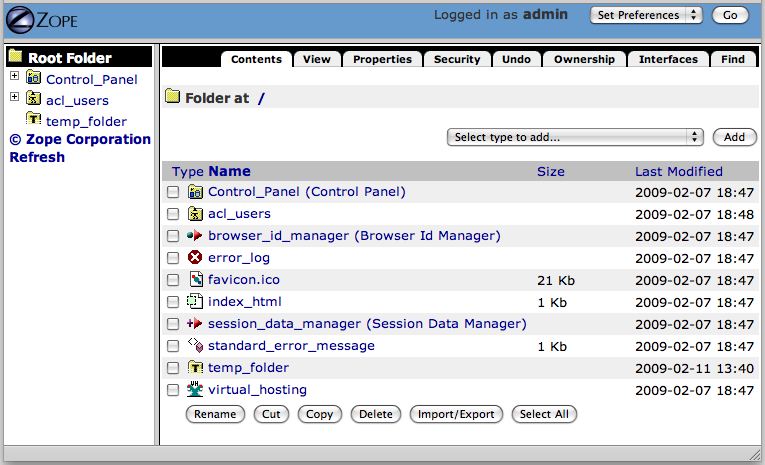 This logging information can be found in the log/event.log file in your INSTANCE_HOME directory. If you forget or lose your initial Zope user name and password, shut Zope down, change the initial user password with the zpasswd.py script, and restart Zope. See the chapter entitled Users and Security for more information about configuring the initial user account. If there’s a problem with your installation that you just cannot solve, do not despair. You have many places to turn for help, including the Zope mailing lists and the #zope IRC channel. If you are new to open-source software, please realize that, for the most part, participants in the various “free” Zope support forums are volunteers. Though they are typically friendly and helpful, they are not obligated to answer your questions. Therefore, it’s in your own self-interest to exercise your best manners in these forums in order to get your problem resolved quickly. The most reliable way to get installation help is to send a message to the general Zope mailing list detailing your installation problem. For more information on the available Zope mailing lists, see the Resources section of Zope.org. Typically, someone on the “zope@zope.org” list will be willing and able to help you solve the problem. For even more immediate help, you may choose to visit the #zope channel on the IRC (Internet Relay Chat) network. See the Freenode website for more information on how to connect to the FreeNode IRC network.